It’s Colts 13, Houston 0 as the half winds down. My wife and I are watching Peyton Manning lead the Colts to yet another NFL victory on a big flat screen TV. Nothing strange about this, except it's Wednesday afternoon and we are sitting in the lobby of the Dental Hospital in the heart of one of the poshest districts in Bangkok. Like many other cash-strapped seniors, we are dipping our toes into the wave of the future with our first adventure in medical/dental tourism. This is not my first dental experience in Thailand. In the late 1990s, on a flight to Thailand for a business trip, I cracked a temporary bridge eating some nuts. It didn’t hurt and wasn’t much of a problem at first, but as I talked and chewed, the sharp edge of the broken bridge jabbed into my tongue. 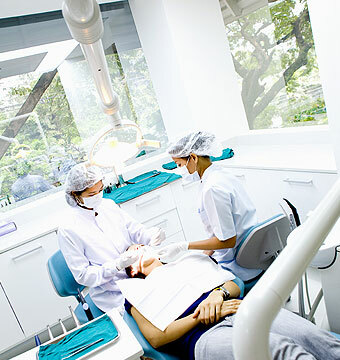 The easy solution – don’t eat or talk for two weeks -- was not an option, so the first thing I did upon landing in Chiang Mai was to ask my colleague who met me at the airport to recommend a dentist. The dentist office did not look promising. It was dark and dingy with equipment I hadn’t seen in years. The possibility of pain was the least of my worries, though. It was at the height of concern about the spread of AIDS throughout SE Asia, and I wasn’t at all sure that I wouldn’t get the disease from this hapless dental adventure. My heart started pounding and I broke out into a sweat. “Should I leave and risk looking like a wimp and insulting my colleague,” I asked myself, “or should I stay and risk pain and death?” The risk of embarrassment won out over the risk of pain and death, as it usually does for me. As the dentist lowered my chair to get a better look, I gulped, or at least the closest thing to a gulp given the wad of cotton in my mouth. I caught a glimpse of my colleague in the waiting room smiling and waving to me as if I had nothing to fear. In just a few seconds I realized that he was right.